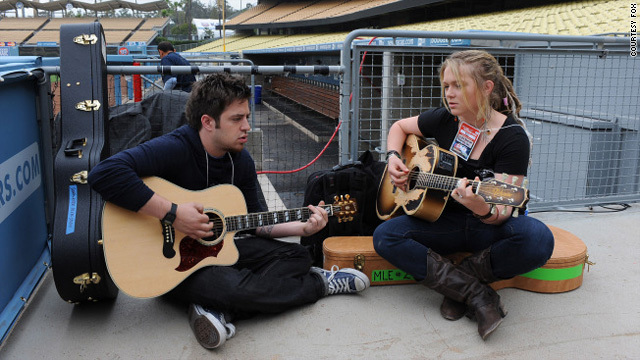 Lee DeWyze and Crystal Bowersox will face off in an "Idol" finale that hasn't come close to generating last season's buzz. Ratings and voting tallies have been down this season on "Idol"
Editor's note: CNN's Lisa Respers France blogs live during "American Idol" performance and results shows. Join her on the Marquee blog. (CNN) -- This time last year, "American Idol" fans were in a frenzy. The finale was a showdown between "bad boy" Adam Lambert, whose performances were called refreshing by admirers and over the top by detractors, and "church boy" Kris Allen, who rose seemingly from nowhere to become a contender. Passions were high. As Crystal "MamaSox" Bowersox gears up to challenge Lee DeWyze for the season nine title, it's a less-than-energetic ending to what has been, for many observers, a lackluster season. "This year it doesn't feel like anyone has had the hunger to win," says MTV's "Idol" expert, Jim Cantiello. "It seems like everyone just had the goal to get on tour and once the top 10 hit, [contestants] were like 'I'm good.' "
There were some new wrinkles this year. Judge Paula Abdul was replaced by Ellen DeGeneres, a hit-or-miss situation for many. Some CNN.com commenters praised DeGeneres for bringing to the table a much-needed fan perspective; others slammed her for being "too nice." Then there was the brief appearance of a backstage camera, meant to capture intimate moments after a performance. Even that didn't work: Instead of insight, viewers were treated to a green room filled with contestants looking awkward as they hugged even the worst of the performers and offered a less than convincing "good job." Still, for all the judges' critiques and technical cues, "American Idol" comes down to the contestants, and it has been the contestants who have been the season's weakest link. "I've been disappointed from the start," says Donna Reynolds, who has blogged about the show for various publications since season two. "I don't think the right people made it to the top 24, I don't think the right people made it to the top 10, and I think the wrong people stuck around too long. The whole season has just been dull and there has been nothing buzz worthy, really." Reynolds isn't alone in her assessment. "The pool of contestants was widely considered to be the weakest in the show's vaunted history, with the top 10 finalists, who will perform together on this summer's American Idol Live! tour, comprising a bizarre mix of pop/R&B singers with identity crises and guitar-strumming 'street busker' types, as Simon Cowell likes to call them," wrote Billboard.com's Monica Herrera. Fan engagement with the contestants and the show is crucial to "Idol," and if this season is any indication, many of them are over it. Ratings are down and there were 41 million fewer votes for this year's top three than there were last season. Moreover, Billboard.com reports that websites that cover "Idol" have seen their cumulative unique visits per month drop 45 percent since 2007, according to data from comScore. Katherine L. Meizel, author of the forthcoming book "Idolized: Music, Media, and Identity in 'American Idol' " and a writer for Slate's "Idolatry" column, says there is a sense that people are "abandoning ship" on the show with the departure of Abdul last season, as well as music director Ricky Minor and judge Simon Cowell at the end of this season. "When things start changing drastically, it right away makes people feel less connected," Meizel said. MTV's Cantiello says there also hasn't been much excitement, given that Bowersox was anointed so early as a front-runner, with DeWyze not very far behind. When the pair made the top three along with Casey James, there wasn't nearly as much of a sense of anticipation as the previous season, Cantiello says. "Last year there was that moment where Kris Allen made it into the finale with Adam Lambert over Danny Gokey and it was such an organic, cool watercooler moment," Cantiello says. "Versus this year when the watercooler moment was the judges telling us that Lee DeWyze had just had 'a watercooler moment.' "
There's also no clear distinction between the final contestants this season. Both Bowersox and DeWyze are singer/songwriters who seem pretty evenly matched in talent and more confident behind their guitars than on camera. Of course, someone has to win it. Blogger Reynolds says Bowersox, with her dreadlocks and harmonica, has shades of last year's runner-up Lambert in that she's a bit more individualistic than DeWyze. Yet Bowersox in no way generates the same heat with fans as Lambert did, Reynolds says. "I like Crystal and I enjoy watching her, but she hasn't been able to captivate viewers the way Lambert did every week," Reynolds says. She's not that much higher on DeWyze: "With Lee, he just bores me and I don't get the adulation of him by the judges." iReport: What do you think of "Idol" this season? The finale numbers could further tell the tale of season nine -- though author Meizel cautions against writing obituaries for a show which, despite its dip in the ratings, continues to rank No. 1. "Idol is still in the lead over pretty much all other television shows," she said. "A few million people fewer over nine years doesn't necessarily herald the end of 'American Idol.' "